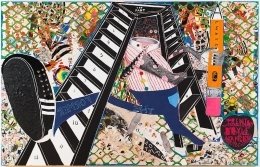 TRENTON DOYLE HANCOCK The Former and the Ladder or Ascension and a Cinchin’ 2012 Acrylic and mixed media on canvas 84 x 132 x 3 in. TRENTON DOYLE HANCOCK As U Now Enliven A Test... 2012 Acrylic and mixed media on canvas 24 x 24 in. TRENTON DOYLE HANCOCK The Den 2012 Acrylic and mixed media on canvas 84 x 132 x 3 in. TRENTON DOYLE HANCOCK Plate of Shrimp 2012 Acrylic and mixed media on canvas 60 x 54 x 1 1/2 in. TRENTON DOYLE HANCOCK Kept on Keeping On 2012 Acrylic and mixed media on canvas 60 x 60 in. 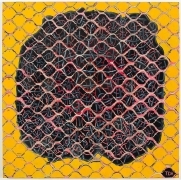 TRENTON DOYLE HANCOCK Black Mamba 2012 Acrylic and mixed media on canvas 72 x 60 x 3 in. TRENTON DOYLE HANCOCK Waiting 2012 Acrylic and mixed media on canvas 30 x 24 1/2 in. TRENTON DOYLE HANCOCK All Things Known and Nothing to Own 2012 Acrylic and mixed media on canvas 10 x 8 in. 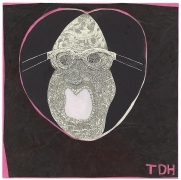 TRENTON DOYLE HANCOCK Portrait of the Artist Under Night 2012 Acrylic and mixed media on canvas 12 x 9 in. TRENTON DOYLE HANCOCK The Moment of Truce 2012 Acrylic and mixed media on canvas 24 x 24 in. TRENTON DOYLE HANCOCK Qui est-ce? 2012 Acrylic on canvas 18 x 18 in. TRENTON DOYLE HANCOCK You're Unfortunate if You're Disproportionate so Stop Forcing it 2012 Acrylic and mixed media on canvas 24 x 24 in. TRENTON DOYLE HANCOCK She'll Know Me When She Sees Me 2012 Acrylic and mixed media on canvas 14 x 18 in. TRENTON DOYLE HANCOCK Dangerous Tores and Snares 2012 Acrylic and mixed media on canvas 18 x 14 in. TRENTON DOYLE HANCOCK With The Money I Have Left 2012 Acrylic and mixed media on canvas 12 x 16 in. TRENTON DOYLE HANCOCK 4 Hours in this Wretched Contraption 2012 Acrylic and mixed media on canvas 14 x 11 in. TRENTON DOYLE HANCOCK A Lateral Movement: Hit the Ground Punching 2012 Acrylic and mixed media on canvas 14 x 11 in. TRENTON DOYLE HANCOCK If You're Too Fat, You Should Buy Clothes That Fit 2012 Acrylic and mixed media on canvas 14 x 11 in. TRENTON DOYLE HANCOCK This is the Way 2012 Acrylic and mixed media on canvas 12 x 9 in. TRENTON DOYLE HANCOCK The Loss of Lies Reossifies the Cross of Eyes 2012 Acrylic and mixed media on canvas 18 x 12 in. TRENTON DOYLE HANCOCK The Irreducible Crucible 2012 Acrylic and mixed media on canvas 18 x 12 in. TRENTON DOYLE HANCOCK Quinton Trenton 2012 Acrylic and mixed media on canvas 18 x 14 in. TRENTON DOYLE HANCOCK The Everlasting Arms, version #2 2010 Acrylic and mixed media on canvas 60 x 60 in. TRENTON DOYLE HANCOCK Hot Coals in Soul 2010 Acrylic and mixed media on canvas 84 x 114 in. TRENTON DOYLE HANCOCK Like A Thief In The Night 2010 Acrylic and mixed media on canvas 60 x 60 in. TRENTON DOYLE HANCOCK The Impatience of Progress #2 2010 Pigmented paper pulp, stencil washed paper pulp and STPI handmade paper 82 3/4 x 71 1/4 in. TRENTON DOYLE HANCOCK ...and then it All Came Back to Me 2011 Mixed media on paper 9 x 8 in. Texas-based artist Trenton Doyle Hancock returns to New York for his fifth solo exhibition at James Cohan Gallery, from November 8th through December 22nd, 2012. 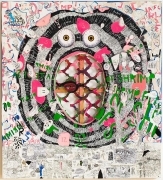 The artist is well known for creating densely layered mixed-media installations that merge words and images in painting, collage, sculpture, print, and the performing arts. For this exhibition, Hancock departs from the ongoing epic narrative that has guided his work for the exhibitions decade. 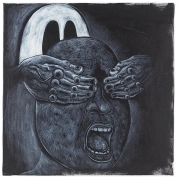 Here, he creates a body of new paintings that reveal the creator of the myth and demystify the author. ...And Then It All Came Back To Me expands on metaphysical interpretations of the artist’s dreams, the invented symbolic language that has long been a hallmark of the work, and most notably on the idea of self-portraiture as exploration of the artist-as-archetype. 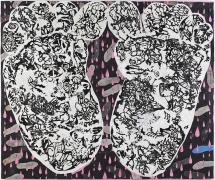 In this new body of work, which Hancock refers to as “radical autobiography,” the action takes place at the front of the picture plane, with complex terrain behind. An intense spotlight shines on the protagonist—Hancock himself—that forces us to contemplate whether this character is hero or failure. “How absurd is it to be an artist?” Hancock asks. Word-plays, palindromes, maxims and proverbs provide a springboard for the visual imagery and set the mood of the paintings. 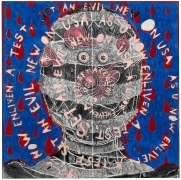 These witty and often self-deprecating poetic musings of the artist’s invention are cut out or collaged onto the canvas, creating texture and tone. 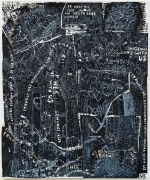 Hancock works to marry the image to the text, which in turn informs the work’s titles. 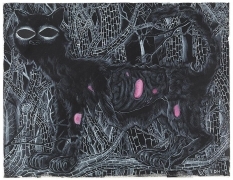 Viewers will find a rich trove of references in these emotionally charged paintings, with motifs from the artist’s personal lexicon of reexhibitions images including bones, cats, cages, feet, bloodshot eyes, black and white striped fur, and pink flesh. 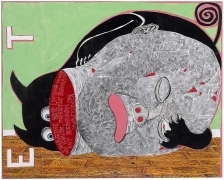 Additionally, Hancock gathers inspiration from many outside sources: the late work of Philip Guston, which also used the artist’s studio as subject; Mathias Grünewald’s Isenheim Altarpiece, in which, Hancock says, “you can see the torture of the world in Christ’s gnarled foot”; B-grade horror films that inspire Hancock to create “serial killers for the eye”; and the artist’s devout Christian upbringing, with its stirring tales of martyrdom and re-birth. Important to the artist’s oeuvre are the large scale public installations and performing arts works that have been commissioned by the Austin Ballet, Cowboys Stadium and Olympic Sculpture Park. 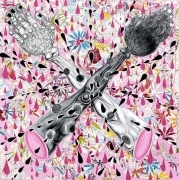 Hancock’s work has been exhibited nationally and internationally, including in the 2000 and 2002 Whitney Biennials. 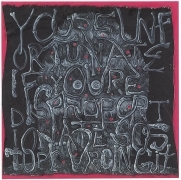 Important solo exhibitions include the 2010 survey exhibition We Done All We Could and None of It’s Good, originating at the University of South Florida Contemporary Museum and travelling to Savannah College of Art and Design; Weatherspoon Art Museum, Greensboro, NC. 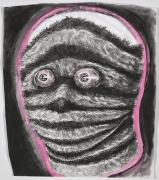 In 2007, Hancock’s European solo exhibition The Wayward Thinker, was mounted at the Fruitmarket Gallery, Edinburgh, and traveled to the Museum Boijmans Van Beuningen, Rotterdam. 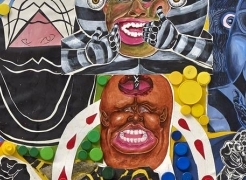 In addition, solo exhibitions have been mounted at the Contemporary Arts Museum, Houston; Modern Art Museum of Fort Worth; Cleveland Museum of Art; and Museum of Contemporary Art, North Miami. 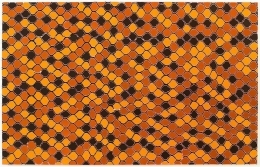 Recent projects include a commission to produce a 40 x 108-foot mural for the new Dallas Cowboys Stadium, a residency at the Singapore Tyler Print Institute, and a site-specific installation at the Olympic Sculpture Park in Seattle. Hancock was the 2007 recipient of the Joyce Alexander Wein Award from the Studio Museum Harlem, NY. Hancock lives and works in Houston, Texas.